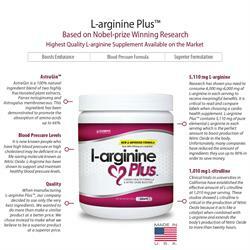 AMERICAN FORK, UT--(Marketwired - December 15, 2015) - Numerous studies indicate that the ingredients in the popular health supplement L-arginine Plus® may contribute to the prevention of stroke among adults. It may also play a role in the reduction of cholesterol levels, and the improvement of blood pressure, both of which contribute to helping combat heart disease. Strokes, or cerebrovascular accidents, are the fourth leading cause of death in the United States. They occur when there is a blockage or rupture in a vein that provides nutrition and oxygen to the brain, causing irreversible damage. This can be caused by too much fat, high blood pressure, or from concomitant diseases such as diabetes, which reduces the health of the vascular system. Due to the unique chemical composition of vitamins and nutrients in L-arginine Plus®, regular intake of the supplement may help reduce certain risk factors when taken consistently. The product contains a perfect dose of L-Arginine, which triggers increased formation of Nitric Oxide (NO). Nitric Oxide plays a major role relaxing the smooth muscle cells in blood vessels walls through a process called vasodilation, which may reduce the risk of stroke among healthy and ill individuals. Double blind, randomized, crossover trials that included healthy adults and those that suffer from heart disease concluded that the inclusion of the amino acids L-arginine and L-citrulline, available in the popular supplement L-arginine Plus® had a positive effect on overall cardiovascular health. 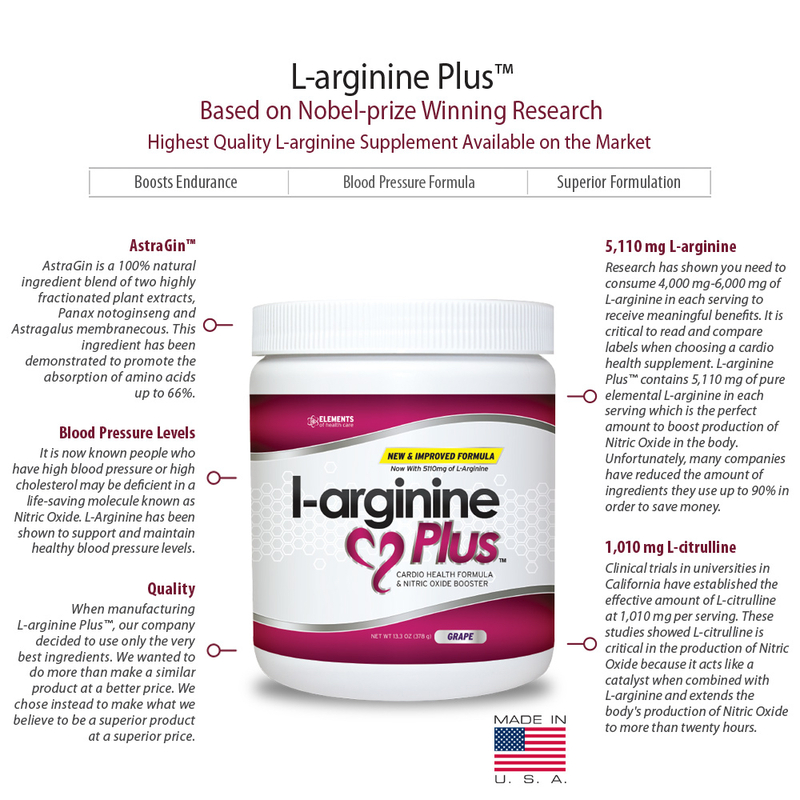 L-arginine Plus® was created following the research of Dr. Louis Ignarro, who won the 1998 Nobel Prize for his discovery the benefits of Nitric Oxide in the human body. The inspiration for the supplement was triggered by his book 'No More Heart Disease' and focuses on boosting the daily intake of L-arginine to enhance body performance. Since its release, the product has grown to help thousands of people everyday. L-arginine Plus® powder offers 5110mg of the amino acid L-arginine, which is within the average daily recommendation of 4,000mg-6,000mg, L-Citrulline to which works in synchrony with L-Arginine, complex carbohydrates, red wine extract, folic acid, magnesium, and vitamins B6, B12, C, D3, and K. Other studies also indicate L-arginine may have other important health benefits, including maintaining healthy blood pressure levels, healthy maintenance of Cholesterol, better digestion, increased sexual performance and endurance, and better overall health due to the myriad of other vitamins and amino acids that the supplement provides. The product is available for as little as $32.00 for a 30 day supply, making it possible for customers to live a healthier lifestyle at a lower price than offered by the competition. L-arginine Plus® can be safely added to any diet to reduce the risks of stroke, among other diseases. The low cost and high-quality product was designed to be made easily accessible to all adults across the United States who are looking to improve their lifestyle.